An award-winning, skin-smoothing oat, shea butter, and sugar body smoother with a great maple scent. The Smoothie Star Breakfast Scrub features a super skin-smoothing blend of cupuacu scrubs, banana, almond, and honey extracts to gently polish, smooth, and moisturize the skin. Scented with sweet maple fragrance. Scoop out a handful of the SMOOTHIE STAR™ BREAKFAST SCRUB, rub it between your palms, then scrub in circles onto damp skin until you feel smoother. Rinse well and follow with a body butter or lotion. Precautions: Keep out of the reach of children. This is not a food—yet it is, however, absolutely masterful at tackling chicken skin on your triceps and elbows. Avoid contact with eyes and irritated skin. If contact occurs, rinse well with cool water. 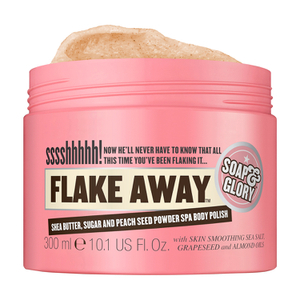 I wanted to try the Soap and Glory line of body scrubs since I use all their body wash and lotions. This was the very first body scrub I purchased. It gently scrubs your skin and does not cause any irritation. It is thick and easy to apply. It does not leave my shower oily and slick which I truly appreciate. I prefer more of an abrasive body scrub but this was nice. My skin was soft and I love the smell. I'm a huge fan of this body scrub. It does an amazing job of making my skin feel smooth and moisturized, and it rinses easily. Always a big plus. My only issue is the fragrance. This stuff smells sooooo incredibly, deliciously, delectably good that I have to have a snack before I shower, else I'm tempted to eat it! Try it, (as a scrub, not a meal), you will not be disappointed.